Features a lightweight aluminium frame with a high quality Suntour front suspension fork, Zoom suspension seat post and comfortable well-padded saddle, upfront a high quality Zoom quick release height and angle adjustable handlebar stem provide the ultimate in comfort. 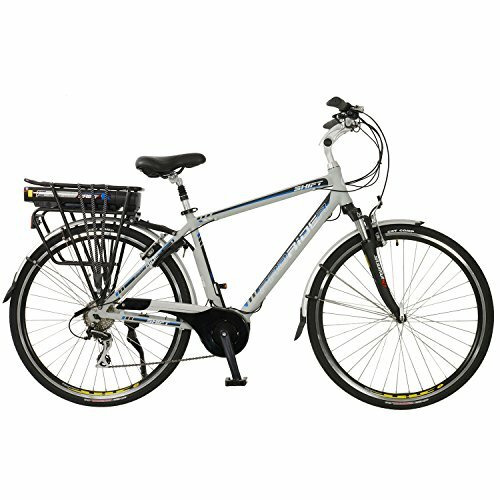 A high quality Dapu branded (Taiwanese) 250W motor offering up to a huge 100nm of torque is powered by a lightweight 36V/10.4AH Lithium ion Panasonic cell battery for reliability, and this gives a range of between 45 and 55km from one charge, gears are provided by the Superb Shimano Acera 8 speed rear derailleur and rapid fire shifter. The Shift also comes supplied with built in rear U lock, front & rear mudguards a rear pannier rack and essential kick stand for easy storage and parking.